As the end of 2017 draws near, it is good to look back at how the cloudscribe set of projects is doing. It has been a busy and productive year with continuous improvements across the cloudscribe projects and documentation along with growing adoption. We end the year with 530 stars for cloudscribe core on GitHub, over 328K downloads in aggregate across the 100 packages that make up the cloudscribe ecosystem. 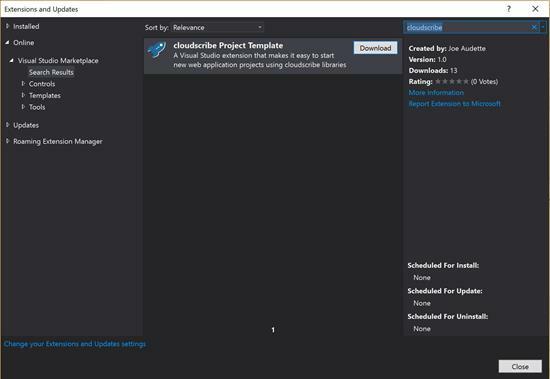 There are almost 1600 installs of our project template for Visual Studio and our analytics show about 29 projects are being created per day with cloudscribe libraries. I would like to thank everyone in the community for providing feedback, bug reports, and for helping to spread the word to other developers. It has been a pretty good year especially considering that we don't have any marketing budget at all so people have found cloudscribe mainly from github, by word of mouth, from this website, and from a few occasional tweets and blog posts. With your help in spreading the word I think 2018 will be a even better!